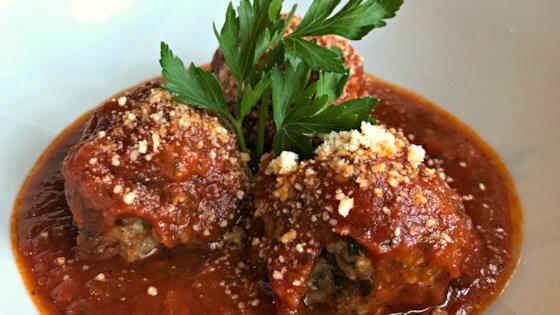 "Homemade meatballs are a very easy to make, and since we skip the very messy step of pan-frying these before they hit the sauce, it becomes downright simple. Here I use a standard half-beef/half-pork mixture. You can substitute water or beef broth for the milk, if preferred." Heat olive oil in a skillet over medium heat. Cook and stir onions in hot oil until translucent, about 20 minutes. Some recipes use equal portions of beef, veal, and pork, which is also nice, yet more expensive. These days you can find all sorts of lean-to-fat ratios for ground beef. Most stores sell 90% lean, 10% fat, but I prefer the 80% lean, 20% fat ratio for this recipe. Once cooked, you can add the meatballs to your favorite prepared tomato sauce for 1 to 2 hours. Amazing!! Made these to add to my spaghetti sauce and they were delicious exactly as written! We froze half of them and I can't wait to use them for meatball subs!